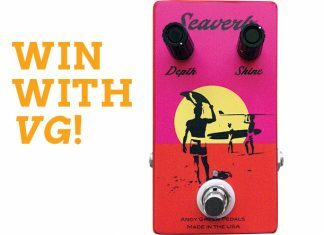 An Internet search for “overdrive pedals” yields 1,610,000 hits, indicating a well-saturated market. 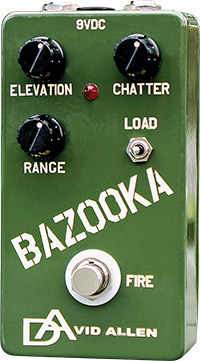 The Bazooka Overdrive stands out from the crowd. Pickup maker David Allen offers a broad line of guitar and bass pickups, all lovingly tweaked to achieve what he calls “The Sound.” Who better, then, to explore the intricacies of the overdrive pedal? Even with an on/off stomp switch (labeled “Fire”), 9-volt DC output, mini switch, and three knobs, the Bazooka doesn’t take up too much pedalboard real estate. As for the other unconventional nomenclature, the Elevation knob controls volume, Chatter means gain, and the Range knob is a highly useable tone control. The Load mini-toggle offers three additional tonal options to tweak: the greatest highs come through in the middle position, and switching either left or right yields varying degrees of mid and bass response. Performing in front of an audience is an acid test for any piece of gear, so we took the Bazooka Overdrive along on a quartet blues gig. With only the Bazooka between a small tube amp and a guitar with stacked humbucking, we cranked up for a Freddie King song. The little tube amp had a natural breakup at small-club performance volume, but we hit the stomp switch anyway, with the Load toggle in the middle position and all knobs set at 12 o’clock. Like focusing a camera lens, the Bazooka smoothed out the jagged edges without sounding like a squashed compressor pedal. Adding Chatter gain for single-note and double-stop soloing, dynamics were enhanced without a lot of extraneous noise. A flip of the Load switch either left or the right added fatness in mids and lows, comparable to changing to bigger speaker cabinets. Further tweaking for a little more treble was possible with the Range knob, and slide guitar had all the sting of Muddy Waters on a roll, with the sustain of Lowell George riding over the top of the band. Other than a tuner, it was the only pedal used on the gig, and I didn’t want to turn it off. Back in the studio, opening up the Chatter knob led to crunchy power chords and singing long tones with almost infinite sustain. (Hey, the power’s gonna go out sooner or later!) Over-adjusting the Range knob led to a trebly snarl, but backing it off just a bit found a golden spot with the sonic ranges all covered. Overall, the David Allen Bazooka proved itself a highly useable OD with an extraordinary range over the sound spectrum. It’s a pedal that can add great diversity to even the simplest rig.